There are a number of theories about the origin of our surname. We believe that the Twitchetts came from France along of William the Conqueror. Not as a noble Knight on a horse with his hawk in his hand, but as part of someone's entourage. It is a family tradition that we came over with the Huguenots, but like most family traditions...we didn't! 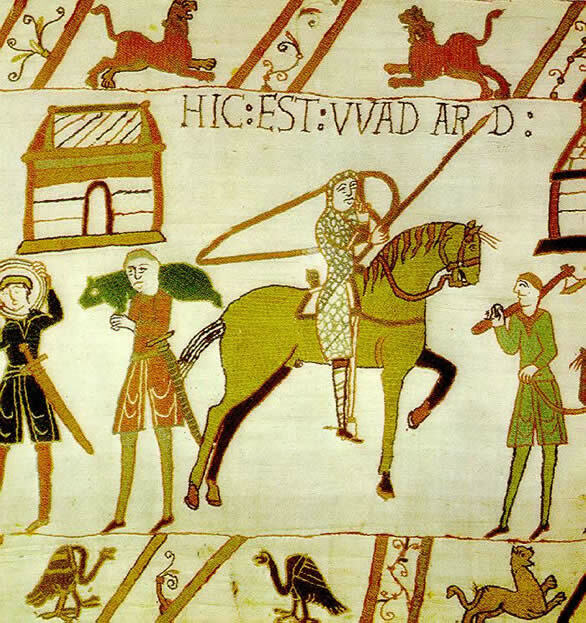 There are a number of theories about our surname, but it is now thought that the name is a derivation of the name TOUCHET, a family that came from France to England soon after the Norman Conquest. So far these people have the honour of being the oldest known family members! Katherine Twychet who died in 1433 in Hertfordshire is our oldest known family member. (Family Footsteps 17 has the details.) Katherine was the wife of John Leventhorp. There are effigies of John and Katherine in Sawbridgeworth Parish Church, Hertfordshire. William Twitchett baptised a daughter, Susan, in 1579 in Sarratt, Hertfordshire. This is a small village in the triangle formed by Amersham, Watford and Kings Langley. Roger Twitchett baptised a son, Raphe, on 13th August 1587 in St. Mary's Church in Watford. William Twitchett married Elizabeth Murrell in 1586 in the village of Oakley in Suffolk. This couple are thought to be the origin of all the Twitchetts found today! Thomas Twitchett, born in 1620 in Lawshall, had sons called Robert and Edward who lived in Bocking and Braintree in Essex. These sons were the origins of the Twitchett families later found in Essex and London, and it was from one of these families that the two boys, Thomas, and Robert came. They later served on HMS Victory at the Battle of Trafalgar. Another William Twitchett baptised his sons Frances and William in 1640 and 1643 respectively. They were baptised in the village of Gt. Wratting on the Suffolk Cambridgeshire border, near Haverhill. It is from this family that the Pakenham and Lavenham Twitchett lines developed. Are there any more like us?